Tenerife's first PADI 5 Star IDC Centre, offers year-round quality scuba diving, diving courses & high safety standards in a spectacular setting, Los Gigantes, the most beautiful corner of Tenerife. Our location is just a few minutes walk from from Puerto Santiago and a short taxi ride from Playa Arena. Los Gigantes Diving Centre, a PADI 5 star Centre (No. S9303) and BSAC school 197. Located directly on Los Gigantes marina, which is situated on the spectacular western corner of Tenerife. Los Gigantes Diving Centre offers quality scuba diving in Tenerife and diving courses on a range of dive sites with something suitable for all levels of diving qualification, including hand feeding Stingrays and Turtles Although registered with the BSAC & PADI, scuba diving licences from all training agencies are recognised. The dive centre has all necessary permits, insurances & is a registered member of the Canary Tourist Board. The family business is operated by brother and sister Neville and Sheila Widdrington (PADI Master Instructor and BSAC 3 star Instructor) and Sheila's son Chris (PADI Divemaster). In 25 years of diving in Tenerife, Los Gigantes Diving Centre is justifiably proud of an unbroken safety record. We aim to keep it that way! A full range of BSAC and PADI courses are available, from beginner to Divemaster, as well as many PADI speciality diving courses. The Dive Centre conducts dives from a 7.5 metre RIB licensed for 12 people - 10 divers, a dive guide and a skipper carrying all necessary safety equipment on board. Our boat mooring is aprox 50 metres walk from the dive centre entrance. We do not put you in a mini bus & drive you several kilometres to a shore dive or to another dive centre. Weightbelts are kept on the boat, further reducing the workload. Our boat is never left unattended at anchor. In compliance with Spanish law & to provide our dives with full safety cover, our boat is always manned whilst divers are in the water. The practice of leaving a boat unmanned during a dive can result in serious incidents. Be careful who you choose to dive with! The skipper is fully licensed as well as being a qualified diving instructor or divemaster, trained in rescue & oxygen administration. Oxygen & first aid kit carried at all times. Although it has never been used in an emergency, it is always available on the boat. Dives are guided by a fully qualifed instructor or divemaster. They are there to help & assist with minor problems & to navigate underwater so that you see the best of each dive site. In the European Union it is compulsory to have scuba diving insurance to cover you for third party liability and medical recompression therapy. We are affiliated with Dive Assure and D.A.N (Divers Alert Network), and can offer policies at very reasonable rates to customers who do not have there own scuba diving insurance. Storage space available in the dive centre. You do not want to carry heavy dive bags around everywhere, after all you are on holiday. Full diving equipment hire is available and divers are provided with weights and 10, 12 or 15 litre steel tanks. We regularly visit around 20 different diving sites consisting of spectacular volcanic scenery, arches and caverns with plenty to satisfy all levels of experience. The only wrecks are the tourists at the end of their holiday! Offshore depths reach 2000 metres, beyond the reach of the most hardened "techies". We put a sensible (and legally required) depth limit of 40 metres on our dives. The only gas mix we offer is 21% oxygen 79% nitrogen "normal air". As most of our dives are of a multi-level nature, good times and safe dive profiles can be achieved. 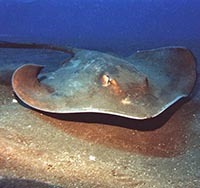 Water temperatures vary from 19° C in the winter to 24° C in the summer and being in a sub-tropical Atlantic Ocean means that large deep sea marine life are occasionally seen whilst diving. Los Gigantes lies at 28 15 N, 16 50W, only 5 degrees north of the tropic of cancer. Situated on the south west coast of Tenerife, beneath the magnificent 500 metre cliffs, Los Gigantes Diving Centre offers diving on the most sheltered part ofTenerife. The islands weather is governed by the North East Trade Winds, the cliffs and the geographical location of Los Gigantes (see map of Tenerife) make the village the warmest & (most important from a diving point of view) calmest resort in Tenerife. A small resort for Tenerife, Los Gigantes offers everything a family or diving group could want and is within a reasonable travelling distance of the many attractions, other than diving, which Tenerife has to offer. Further general tourist information can be accessed from Tenerife.